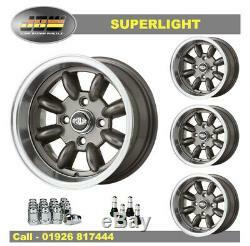 7x 13 Superlight Wheels Classic Ford Set of 4. "SUPERLIGHT", Traditional Design, Superior Craftsmanship, Stylish & Sleek. This Traditional 8 Spoke Alloy Wheel comes painted In Silverwith High-Lighted Rim. Size: 7 x 13 PCD: 4-108. Please note metric 12mmx1.5 wheel nuts will be sent unless otherwise specified at time of ordering. Our products are delivered by national couriers between 7am and 6pm Mon-Fri , to UK mainland addresses. All claims for shortages and/or damages must be notified by telephone within 48hrs and then in writing within 7 days, otherwise claims cannot be entered into. We will do our up most to resolve any such situation speedily, efficiently and amicably. 2: Items are received in an unused re-saleable condition. We reserve the right to levy a charge to replace product packaging which is damaged or defaced. 4: We cannot accept any items which have been specially ordered for you or manufactured to your specifications for return. 6: We are not responsible for any labour charges incurred during fitment or removal of suspected faulty (or incorrectly supplied) parts. Please help us to help you, this does not affect your statutory rights. Designed by E2E Solutions Ltd. The item "7x 13 Superlight Wheels Classic Ford Set of 4 Gunmetal" is in sale since Wednesday, March 27, 2019. This item is in the category "Vehicle Parts & Accessories\Car Wheels, Tyres & Trims\Rims". The seller is "johnbrownwheels" and is located in COVENTRY. This item can be shipped to all countries in Europe.